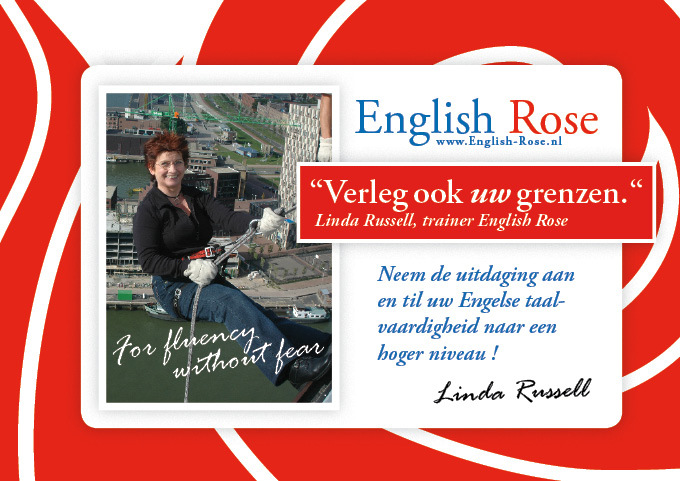 My name is Linda Russel and my passion is to enable people to overcome their fear of speaking English, so that they can be as confident when communicating in English as they are in their own language. I adapt my teaching style to fit the needs of the learner. The common theme in all the lessons is that they’re enjoyable as well as informative. I’ve taught dozens of nationalities of all ages and a wide range of professionals eg managers, secretaries, technicians, scientists, university students, lecturers and TV personalities. Each new teaching project is exciting – the more challenging the assignment the more creative and enthusiastic I become! I do translations (Dutch to English), proof-reading, coaching eg job interviews, run (business) English courses and workshops. I’m a voice-over artist- in English! I moved from London to the Netherlands, more than 20 years ago. Before I decided to teach English as a second language full-time, I had an administrative job, ran a B&B in Leiden, set up an ironing serviceand worked as a telephonist for a taxi service.